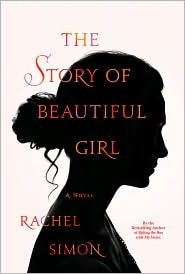 I was already a huge fan of Rachel Simon’s thoughtful and engaging memoirs (Riding the Bus with My Sister and Building a Home with My Husband), so I was thrilled when I heard about her new novel, The Story of Beautiful Girl. I was not disappointed. All the writing talent Simon showed in her memoirs comes shining through in her novel. It is a beautiful story, beautifully written. Lynnie, a young white woman who is mentally disabled, has been living in an institution since her childhood (it is now 1968) and learned long ago to protect herself by not speaking. Homan is a deaf African American man who has also been institutionalized and forgotten by society. Lynnie and Homan fall in love and plot their escape. Their freedom is short-lived, however, and the authorities soon catch up with them in a farmhouse where a kind widow named Martha has taken them in for the night. Unbeknownst to the authorities, Lynnie gave birth to a daughter before they caught up with her. She whispers two words to Martha, “Hide her,” before she is taken back to the despised institution and Homan evades capture and disappears into the night. The rest of the book is devoted to following each of their lives – Lynnie, Homan, Martha, and the baby – as Lynnie and Homan desperately try to find each other and the baby again. It is a story of highs and lows, ranging from the horrible conditions and treatment of patients in the institution to the touching, undying love that Lynnie and Homan feel for each other, from the way that disabled people were cast aside just a few decades ago to the selfless actions of Martha toward people she had just met. The characters feel real and the plot twists are unpredictable. Though it may sound depressing to some, this is a love story at its heart and it is ultimately uplifting. Simon’s writing is wonderful – compelling, engaging, beautiful prose that pulls the story along. I was immediately drawn into these fictional lives, feeling a part of their story. I never wanted it to end, and for me, that is the sign of a truly wonderful book. I mentioned last week in The Demise of Bookstores that Borders is closing, as you have all probably heard by now. I went on a pilgrimage to our local store, a favorite of mine, this morning to use my very last $10 gift card and check out their clearance sale. Of course, I spent more than just my $10! I found a hardcover The Sweetness at the Bottom of the Pie by Alan Bradley for just $4.99 (plus all books are 10% off). I have been meaning to read this popular best-seller for years! It wasn't on the Clearance racks, so a mere 10% discount, but I just couldn't resist the memoir The Lost Girls by the trio of Jennifer Baggett, Holly C. Corbett, and Amanda Pressner about three women who celebrate turning 30 by taking off for a year-long trip around the world. Another book I've been dying to read! For my husband, I grabbed mystery master Ed McBain's Killer's Wedge for just $4.99. He loves suspense, so I also got him Another Thing to Fall by Laura Lippman, whose novels we have both enjoyed before, for $5.99. I thought this was their last week, but the cashier explained that they are hoping to stay open until September - obviously, the more stock they can sell, the better, so I expect the discounts will grow larger as the weeks go by. Right now, everything in the store is at least 10% off, many nonfiction genres are 20% off, and there are a few things at 30-40% off. I got most of these on the Bargain shelves that they usually have in the store, but I imagine at some point, everything will be bargains. I will probably go back with my kids in a week or two. It's Tuesday and that means Top Ten day over at The Broke and the Bookish. Today's topic is Books That Tackle Tough Issues. I love this one because I always enjoy thought-provoking books that teach me or make me think about something (I love the alliteration, too!). In fact, I wrote my own Top Ten list a few years ago of Books That Taught Me Something, which is a bit similar. For this week's list, I tried to stick to more recent books I've read that have tackled a wide variety of tough topics for adults (you can read my Top Ten list of Kids/Teen Books at Great Books for Kids and Teens). What are your favorite books that tackle tough issues? What's that sound?? Ah, it's silence. This weekend, my husband and I dropped off our two teen boys at their grandparents' house for their annual week of sailing with Gramie and Pop Pop. 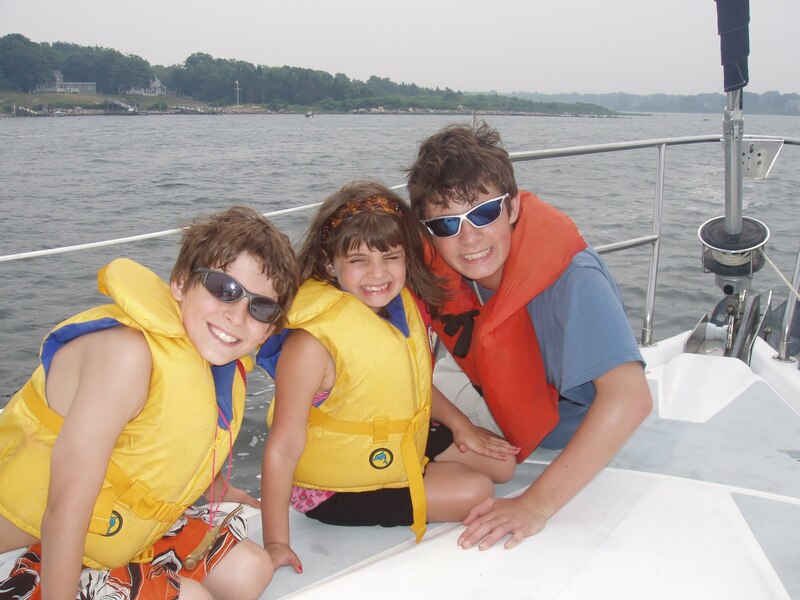 They love this week - it's the highlight of the year for them (that's them with their cousin a few years ago on the Grandkids' Cruise). And for me? It's a well-deserved week of quiet solitude in the midst of a crazy-busy summer. I hope to catch up on all the stuff (especially writing) that has been going undone all summer and, of course, fit in lots of reading (though I was a complete lazy bum last night and watched two movies in a row instead of reading my book!). This is my week. We kicked off our quiet week with a mini getaway this weekend. My husband surprised me for my birthday Saturday with an overnight near New Hope, PA, a lovely little town along the Delaware River. We had a fabulous dinner and enjoyed some much-overdue quiet time together. I am reading The Passage by Justin Cronin, part of my Summer of the Big Book effort to catch up on some hefty reads. It's almost 800 pages, so I'm only about a quarter of the way through so far, but it is really, really good (though really creepy). My husband, Ken, finished Room by Emma Donoghue. He liked it very much, and we even had time to discuss it over dinner this weekend! Ken is now reading The Burning Wire by Jeffrey Deaver, a Father's Day gift from us. He says it's good so far. Jamie, 16, spent a lot of time with friends last week, so he had less reading time than usual. He finished re-reading City of Ashes by Cassandra Clare. Jamie was thrilled when Rip Tide by Kat Falls showed up at our house last week. It is the sequel to Dark Life which he loved last summer, so he re-read Dark Life and took the new sequel with him on the boat. He loves to read water-centric books while on the boat, and these take place in a future community deep below the ocean. Craig, 13, took an old favorite on the boat with him. He's decided to re-read the Charlie Bone books which were the first books to really grab his interest a few years ago. Ken and I finally finished an audio book this weekend that we started almost 9 months ago! We rarely have time alone in the car together, so on our way home yesterday we finished Sarah Silverman's memoir, The Bedwetter: Stories of Courage, Redemption and Pee. We weren't familiar with the comedienne before we listened to this, but I guess this was classic Silverman: hilarious and outrageous, sometimes a bit uncomfortable, and sometimes suprisingly touching. In addition to my post on the Summer of the Big Book last week (I could still use some advice on that one! ), I also posted about The Demise of Bookstores and was very sad to come home yesterday and hear that our own Borders is closing this week (I guess they are now closing ALL stores). I will be stopping by their clearance sale this week to spend one last, remaining gift card. So sad. 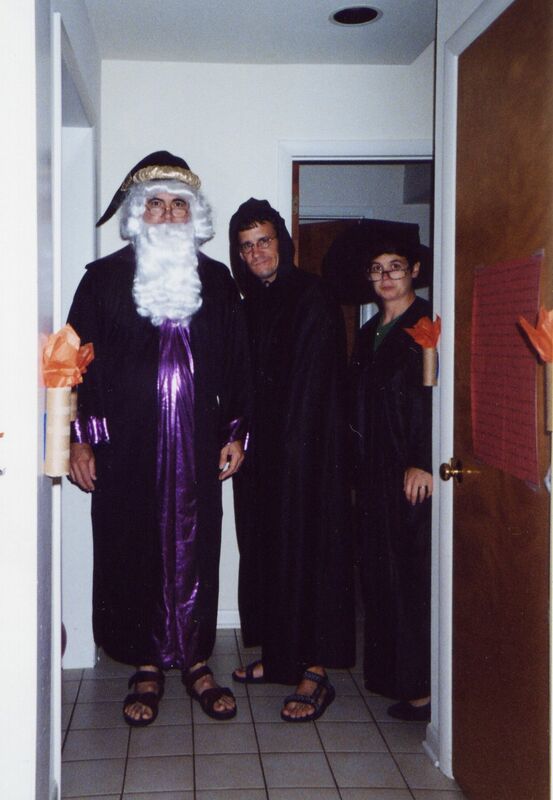 I did manage to post one measly review last week at Great Books for Kids and Teens on Harry Potter and the Deathly Hallows (book and movie). I hope to use some of my writing time this week to catch up on reviews! I recently read this column by author Mitch Albom (of Tuesdays with Morrie fame) about the downfall of Borders as a symbol of the challenges facing all bookstores. I enjoyed his column and found it interesting. We often hear writers and readers bemoaning the decline of independent bookstores, so I found it intriguing to hear Albom apply many of these same laments to Borders' bankruptcy and on-going difficulties. I know that Borders is sometimes considered an evil "big box" store - on a par with all the other huge conglomerates now clogging America's suburbs - but I have to admit that, like Albom, I have a soft spot in my heart for Borders. I loved his descriptions in this essay about the joys of exploring the big bookstores, and I agree. I love going to Borders and for some reason have always preferred it to Barnes & Noble (though I did mostly shop at a local, independent bookstore for the few years we had one in our town). I was hoping that the bankruptcy proceedings would save the chain, but I guess it's not looking good. Even though I get many of my books through the library - I just can't afford to buy all the books I read! - I will continue to buy books as gifts, at Borders while it's there or at an independent bookstore that's a bit of a longer drive from here. What will happen in the future? I can't even imagine a world without bookstores to roam and browse through. Both of my book groups take the summer off, so when I returned from vacation a few weeks ago, I was faced with a delightful decision - what to read the rest of the summer? I perused the towering piles of books waiting to be read on my bookshelf and came up with a great idea - with no book group commitments to get in the way, I am going to tackle some of the Big Books on my shelf that I've been postponing because I never seem to have time to get all the way through them. Last week, I got a good start by re-reading Harry Potter and the Deathly Hallows, definitely a Big Book at 759 pages. Now I have started The Passage by Justin Cronin, with a hefty 766 pages, a book that I really wanted to read but have been putting off since last July because of its intimidating size. I know these big books will each take me a while to get through, so I won't be able to read all of them this summer. Which one should I read next? Help me decide! July 18...summer is already half over! We had a very busy week here, filled with doctor's appointments, errands, and running the kids all over. Whatever happened to the lazy days of summer? I read Harry Potter and the Deathly Hallows (my second time) in preparation for the last movie which we went to see on Sunday. Both the book and movie were fabulous! I was glad I had re-read the book because there were a lot of details left out or changed in the movie, and I was reminded of just how wonderful J.K. Rowlings' books are - by this weekend, I was at the point where I didn't want to do anything but read, and I didn't care what was left undone! I've included a few photos here of Jamie's 8th birthday when we put together a big Harry Potter party and transformed our entire house into Hogwarts. 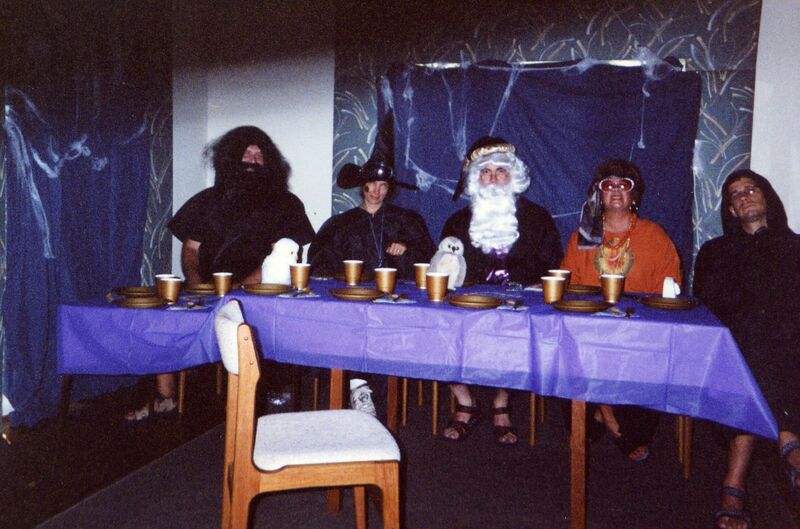 We recruited some friends to help play the roles of the professors (you can see everyone at the table in the Great Hall below; I was Professor McGonagall, on the right in the photo with Dumbledore and Snape). The kids all had a blast, as did the adults! Last night, I just started The Passage by Justin Cronin, a July birthday gift from my husband LAST summer that I have finally gotten around to reading. I've just started it, but it seems intriguing so far. My husband, Ken, is reading Room by Emma Donoghue, based on my recommendation. Jamie, 16, is re-reading City of Ashes by Cassandra Clare, and he told me this morning which five books are next on his list! He has it all planned out. 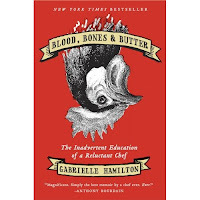 I finally started to catch up on my backlog of reviews last week, posting new reviews of Blood, Bones and Butter, a memoir by chef Gabrielle Hamilton, and Deadly, a teen historical novel by Julie Chibarro. I also posted my Top Ten Lists of Authors I'd Like to Meet and Kids'/Teen Authors I'd Like to Meet. I heard an hour-long interview with author chef Gabrielle Hamilton on NPR one day and was so fascinated with her unusual life story that I downloaded her new memoir from Audible (frustratingly, this link is not to the full interview I heard, which I can’t find online, but to a shorter one that was also broadcast on NPR; an excerpt is included at the link). 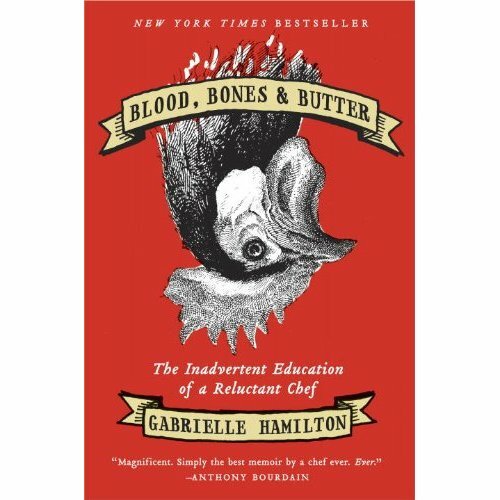 Blood, Bones and Butter: The Inadvertent Education of a Reluctant Chef is not only the story of how Hamilton became a chef but also the story of a very unusual life. Although the author shares some wonderfully warm stories of growing up in rural Pennsylvania (not too far from where I live) with her brothers and sister and loving parents, surrounded by fabulous foods served by her French mother, her life fell apart when her parents divorced. She was basically left on her own during her teen years, and, as you might expect, she got into plenty of trouble. In between and in the midst of that trouble, though, she began working in kitchens – restaurants, catering, even summer camp – and eventually became the chef and owner of the very popular Prune in New York City. Hamilton’s unusual and difficult life has left her with plenty of unresolved issues. Her memoir is very honest and raw, and she does not shy away from the difficult topics. In fact, sometimes she dwells on them: her very odd marriage to her Italian husband, her continued resentment of her mother for leaving, her switching back and forth between lesbian and heterosexual relationships. As someone who loves both good food and memoirs, I thoroughly enjoyed listening to Blood, Bones and Butter. Hamilton’s descriptions of summers spent in Italy were almost worth the cost of the audio alone, though I was also captivated by the stories of her unusual life path. Now, I’m hungry - I need to take a trip to NY to visit Prune. Anyone want to join me? NOTE: If you are offended by swearing, it’s best to pass this one up! Where in the World Are You Reading? Update: Although Gabrielle Hamilton has traveled all over the world, most of her book takes place in New York City, as well as Bucks County, PA, and Italy. Since I already had pins in all 3 locations, I chose NYC, since the majority of the book takes place there. 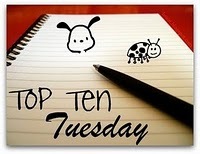 It's Top Ten Tuesday over at The Broke and the Bookish! Today's topic is an intriguing one - authors I'd like to meet. I put some thought into this one and didn't just choose my favorite book authors (though many of them are) but ones I thought would be interesting to meet and talk with. Rebecca Wells – I want to sit with her on a big porch, eat Cajun food, and talk to her about Louisiana, our mutually favorite place. Jodi Picoult – I’d love to talk to her about all the thought-provoking issues she brings up in her novels. Ken Grimwood – he wrote my favorite book of all time, Replay, and I’d love to talk to him about how we’d live our replays. 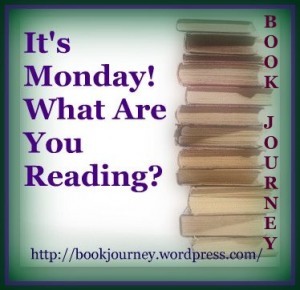 Janet Evanovich – seems like she’d be a lot of fun and lots of laughs! Nevada Barr – we share a love of national parks – I would love to talk to her about her experiences as a park ranger and her suspense novels set in parks. Michael J. Fox – I loved his memoirs and would love to talk to him about living with chronic illness. Besides, he's got such a great sense of humor! Geraldine Brooks – I have loved every single one of her books. Toni Bernhard – this is sort of a cheat because I already know Toni well in the virtual world, but I would love to meet the author of the warm Zen guide How To Be Sick in person. Jennifer Haigh – I love her books. Stephen King – would be absolutely fascinating to chat with, don’t you think? If you're interested in my list of Top Ten Authors of Kids/Teens/YA Books I'd Like to Meet, check out Great Books for Kids and Teens. Which authors would YOU love to meet? Well, life is slowly returning to normal after our trip, though I am still way behind in blogging! Re-entry to real life is always a challenge after a long vacation, but we have finished unpacking and laundry and taken care of the most urgent stuff waiting for us when we got home. I finished Morpheus Road 2: The Black, a teen thriller about the afterlife by D.J. MacHale and enjoyed it. MacHale told the same basic story from Book 1, from the totally different perspective of a different main character, sort of like what Orson Scott Card did with Ender's Game and Ender's Shadow. It was clever and suspenseful. I am now re-reading Harry Potter and the Deathly Hallows (book 7) in preparation for this week's movie release. Fun! My husband, Ken, finished The Killing Hour by Lisa Gardner and enjoyed it. Ken is now reading Dark Life by Kat Falls, a middle-grade sci fi book that takes place under water that our son really enjoyed. Ken says it's good, though he feels the technology is less believable than typical adult sci fi novels. Sixteen-year old Jamie finished Jurassic Park by Michael Crichton and loved it! Jamie is now re-reading City of Bones by Cassandra Clare, book 1 of Mortal Instruments because he enjoyed books 3 and 4 so much on vacation, as I mentioned on the vacation book summary I posted last week. Didn't have a chance to post any reviews last week, but I did post a summary of the books I read in June. I'm going to try to catch up on reviews by writing some mini reviews, starting this week, so stay tuned! A bit late on my monthly summary, but it's still hard to believe it's July already! We spent most of June on vacation in California, so I enjoyed some great books but wrote very few reviews (well, to be precise, only 1 review!). My So-Called Family by Courtney Sheinmel, a middle-grade novel. Deadly: How do you catch an invisible killer? by Julie Chibbaro, a teen novel about Typhoid Mary. Vanishing Acts by Jodi Picoult, a novel about a woman who discovers her childhood isn't what she thought it was. Amy and Roger's Epic Detour by Morgan Matson, a wonderful teen road trip novel. Little Bee by Chris Cleave, a novel about two very different women whose lives intersect unexpectedly. And I guess that's it. I started two audio books, one for teens and one for middle-grade readers, but I haven't finished either one yet. And technically, I finished Little Bee at about midnight on July 1 on our way home, but I counted it as June. So, that's a nice mix of fiction: 1 middle-grade novel, 2 teen/YA novels, and 2 grown-up novels. No non-fiction this month nor finished audios. I've reviewed only one of these books so far and still haven't completed reviews of everything I read in May! Since I'm so far behind, I think I will just try to write some mini reviews next week to get caught up and take the pressure off. It's always tough to pick a favorite, but I guess it would be Little Bee by Chris Cleave. It was a unique story and very thought-provoking, which I always enjoy. 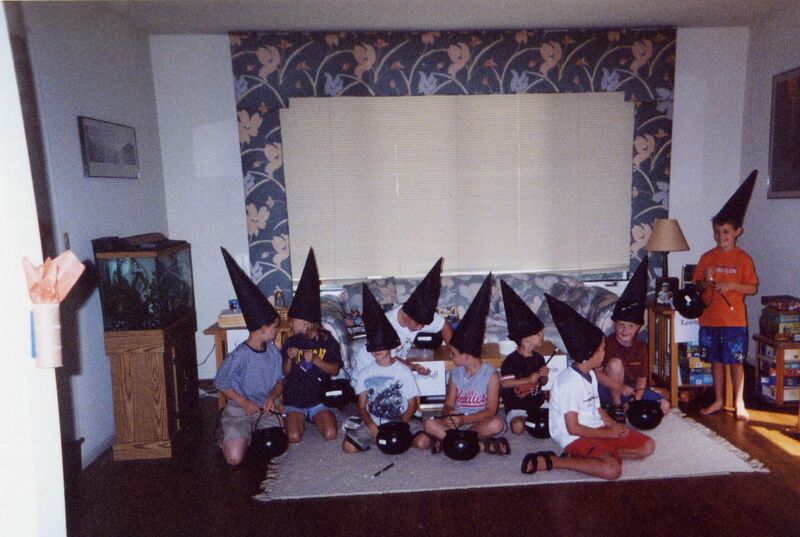 My So-Called Family - CT, I think? Another good month for books for me. What was your favorite book read in June? Happy Fourth of July! I didn't even remember it was Monday until just now...oops. We just returned this weekend from a 3-week vacation in California and Oregon, so that's why I have been absent from the blogging world for so long. Sorry I just sort of left without saying anything, but it didn't seem like a good idea to announce on the internet that we'd be away for 3 weeks! We had a magnificent time and saw so many beautiful sites. This photo was taken at Crater Lake National Park. Yes, it was summer there, too, but they still have over 20 feet of snow! It was mind-boggling, but the views were still gorgeous. If you'd like to see more photos from our trip, you can check out our trip blog (if you scroll down to June 10, 2011, you can see the pictures in order). I started our trip reading Vanishing Acts by Jodi Picoult, wanting a fun, gripping read for the long flight. It was classic Picoult, with alternating viewpoints and a few twists, and I enjoyed it. I love to read road trip books while on a road trip, so next I read Amy & Roger's Epic Detour, a teen book by Morgan Matson, about two young adults on a cross-country road trip that is also an emotional journey. I loved this book, especially the playlists and scrapbook-style entries. Best part: when the characters went to Yosemite right when we were headed there ourselves! Finally, I read Little Bee by Chris Cleave on the way home and absolutely loved it. A very powerful story about hope and redemption and people coming together. I am now reading Morpheus Road: The Black, book 2 in the teen series by D.J. MacHale. I always enjoy MacHale's books. My husband, Ken, read The Little Book by Selden Edwards, a novel he gave me for my birthday last year about an 80's rock star who goes back in time to 1890's Vienna. We both enjoyed it. Ken is now reading The Killing Hour by Lisa Gardner, one of several suspense paperbacks I picked up for him at a library sale. Neither of us had ever read Gardner before, but Ken says this novel is very good. Our 16-year old son, Jamie, read between 10 and 12 books during our 3-week trip! We shipped a box of books out there ahead of time for him, he went through every single one and then had to borrow a book from my aunt for the trip home! That box of books hasn't arrived back home yet, so I won't try to remember all the titles. After a couple days of complaining, we finally got our 13-year old son interested in a book. Jamie had just re-read His Dark Materials Trilogy by Philip Pullman, so Craig started The Golden Compass (he had seen the movie but not read the book), and he actually got caught up in it and has been reading before bed at night. So, it was a wonderful trip with lots of good reading along the way. Unfortunately, the bronchitis I had before the trip came back with a vengeance while we were away, so I am still struggling with that. Hopefully, I will start to get back to normal here soon. I missed hearing about what all of you are reading, so please tell me what books you and your family are enjoying this week!